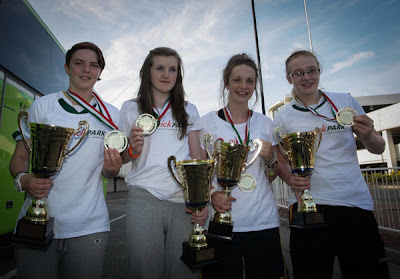 Report from the Irish Amateur Boxing Association on the home-coming after the European Championships for the rather fabulous Women's team. The medal-laden Quick Park sponsored Girls In Green return home to a rapturous reception at Dublin Airport last night following their heroic performances at the EU Women’s Championships in Hungary. 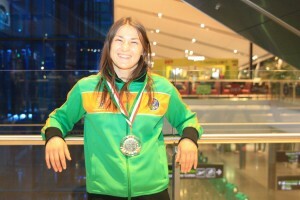 Fifteen medals, a record for Irish boxing, were claimed at the 23-nation tournament in Kezsthely. Katie Taylor, Kristina O’Hara, Grainne Gavin, Amy Broadhurst and Jacqui Lynch went all the way and won gold. Taylor, who has now won 15 major gold medals since 2005, said she was proud to be part of the Irish squad. “I’m just proud to be part of this incredible team, said the Olympic, World, European, EU and Irish lightweight champion and three-time AIBA World Female Boxer of the Year. “Five gold, three silver and seven bronze medals! It’s unbelievable to come away with so many medals from this tournament. The future of Irish women’s boxing is bright with all these young girls coming through,” added the AIBA Ambassador for Women’s Boxing. “The squad performed magnificently, absolutely magnificently in Hungary. Fifteen medals, five gold, three silver and seven bronze, absolutely fantastic, said IABA President Tommy Murphy. “Tournaments like the EU Championships provide our young boxers with invaluable experience. It’s the type of experience that will stand to then as they progress in their careers. “It’s also the type of experience that will prove invaluable going into the Olympic qualifiers down the line and the Olympic Games itself as I would be quietly confident that some of these girls will qualify for Rio 2016. “Our young athletes distinguished themselves in Hungary this week and they represented their country with pride and we cannot speak highly enough of them and our management and coaching staff at the tournament.